I’ve been working once a week in Indiana, Pennsylvania. Yeah, I didn’t know either, but nice place, nice people. I’ve been going for about a month and drinking fat guy shakes. Today, Steph went with me to see where I disappear to on Tuesdays and we decided to add another state, I mean city to our list of adventures. An online search of the area reveals Indiana is the city of sandwiches so we picked a couple of places, the 9th street deli and Steel City Samiches. After a nearly transcendent lunch at the deli, we had pie-in-the-sky hopes for Steel City. Been to a couple Primanti’s. Been told by local Burghers which one you go to matters a great deal. 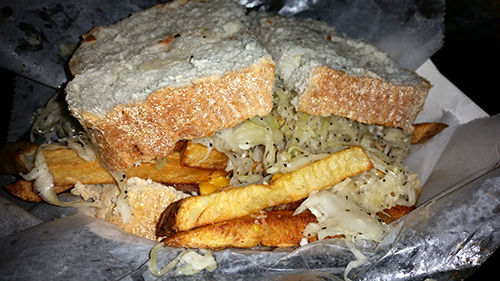 Pretty much liked 'em all…bread, stuff, fries and slaw. I find the slaw the part that makes it really special. Some Indianans claim the original can’t touch theirs…and their right…just not in the way they intended. The place is very baresque and is pretty rough. Done up all in Black & Gold it seems a lot like Primanti’s much less successful 2nd cousin twice removed. Reclaimed furniture, the tvs that are working (Penguins game, of course.) have strange shadows in the pictures, and other things you would expect in a dumpster furnished dorm room. 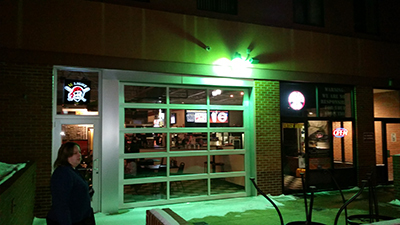 The servers appear to be poorly trained and disaffected students making their first foray into hospitality. We ordered wings with their house special sauce and two sandwiches. It was quickly obvious why this cousin is so much less successful. It just isn’t good. Some of the best meals we have had came in much rougher environs…or at least that’s where they started. But they were really focused on the goods. When the food is great it seems rustic and authentic, when it's not...it just seems dirty and broken down. The wings were probably the best thing we had but it was due to the size and fry. 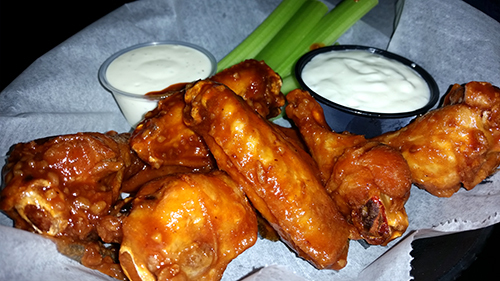 Big and well done wings arrived in Steel City Slicker sauce (a combo or garlic/bbq/hot). The sauce was all at the bottom of the basket and no matter how much you rolled your nugget in it, it didn’t taste like much. Instead of building on each other the three sauces seemed to negate each other. Meh. 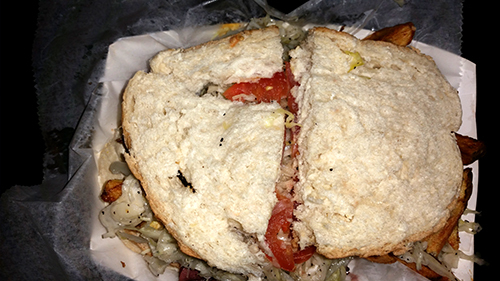 Before I get to the sandwiches…what makes for the ‘Burgh version? Good Italian bread, tangy crisp and layered slaw, fresh dark brown fries, and tasty whatever you order in the middle. We ordered the Van Slyke (pastrami, corned beef, provy and egg) and the Banger (kielbasa, bacon, American cheese and egg). Sounds amazing. Bread. Tastes alright, but both sandwiches appear as though the impractical jokers were trying to punch them closed. Even when the bread starts as a slice, sandwiches such as these are difficult to manage. When the bread arrives already in jig saw puzzle fashion its impossible. Stuffings. Eggs without running yolk or seasoning, pastrami, corned beef and kielbasa all sorely lacking flavor, not enough cheese to notice and I don’t remember bacon at all. Fries. Not a singular grain of salt. Instant fail. Slaw. All celery seed, no bite…or anything else. Slicing Bread With The Hammer Again? 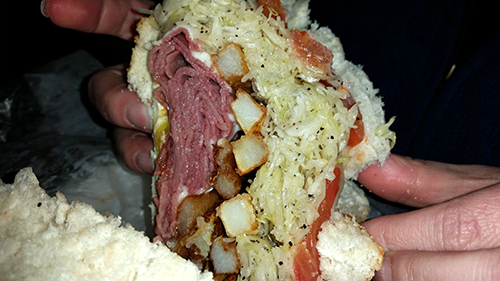 There are great sandwiches in Indiana PA. At Steel City Samiches…they are two blocks away. 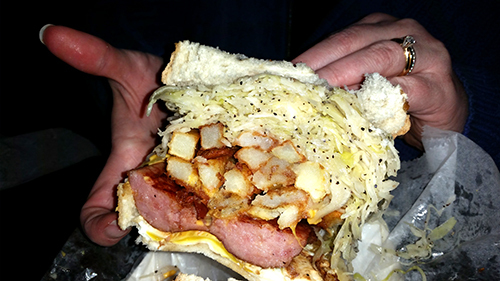 If you want one with fries and slaw, make the hour drive to the 'Burgh.